SwagBucks is a great site to get Free Stuff from, they reward you for using them as a search engine, trading in old cell phones, shopping through the site, and referring friends. You don't have to spend any money, it's 100% Free and it's very easy to use. SwagBucks rewards you with digital dollars called "SwagBucks". You can then redeem prizes, such as electronics, collectibles, gift cards, instruments, and video games. SwagBucks mails the prizes to you for free and you usually get your prize in 2 weeks. This is a great way to get free stuff online, its very simple and best of all Free! I have used swag bucks and received prizes, I have posted pics of the prizes I received as proof that SwagBucks really works! Just got my free flip camcorder from SwagBucks! 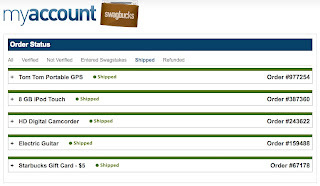 Below is a screenshot of the list of items I have received from SwagBucks. Click to enlarge.. Here is Proof of Apple iPod Touch I received from SwagBucks. SwagBucks has a wide variety of electronics to choose from. Here is an electric guitar I received from SwagBucks. SwagBucks has a good variety of instruments, like acoustic guitars, saxophones, keyboards, and drumsets. It's a great way to get a free instrument to start learning to play. Here is a StarBucks Gift card I received from SwagBucks, it as my first prize from them. SwagBucks has a lot of gift cards available that you can win, gift cards for shopping and for restaurants. There a many ways to get referrals for SwagBucks. Referrals help you earn more on swagbucks and it's a great way to help others get free stuff too. SwagBucks gives you your own special referral link and banners to promote with. You can email you referral link to friends and family and they can sign up. You can make a blog or website and place your banners on it. You can also post on forums or make flyers and business cards that direct people to your website or blog.